Safeway Fuel #2690 - Mascott Equipment Co.
Mascott recommends Petro Defense’s RUST DEFENSE corrosion treatment for Submersible Fuel Pumps! Mother Nature created an particularly unique environment in the Pacific Northwest for corrosion problems in fuel stations. Unfortunately many submersible fuel pumps Mascott Service Technicians encounter show significant corrosion problems caused by bacteria, acetic acid and of course, Water. The best solution is dry containment sumps; Good luck with that in the Northwest! 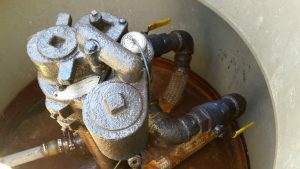 A great solution in fighting corrosion is RUST DEFENSE coatings to your pumps regularly. Contact Mascott Service for a complimentary quotation to RUST DEFEND your fuel station’s submersible pumps. You can find a Rust Defense product brochure on our Products page under both Retail or Commercial Fueling Equipment.